New Economy Project is excited to announce our 20th Anniversary Workshop Series! Please join us for interactive workshops that explore strategies for building a just economy in New York City neighborhoods and beyond. The five-part series is open to community organizing and advocacy groups only. In Sessions 1 and 2, participants will dig into our brand-new curriculum, Make It Happen: A People’s Guide to Building the New Economy. Learn how this new curriculum can work for your organization and members! In Sessions 3-5, we will explore specific new economy strategies and models – from community land trusts and worker co-ops to shareholder action and community-led research strategies. To register, click here or complete this form. Workshops fee = $30 per session. Attend all five workshops for $120. (Fees waived for current grantees of Mertz Gilmore Foundation, New York Foundation, North Star Fund and New York Women’s Foundation). All workshops will be held in midtown Manhattan and are wheelchair-accessible (location provided upon registration). Part 1, Our Current Economy: Unjust and Unsustainable (Aug. 10) – This session engages participants in understanding our economy and how we got here. We will draw from the curriculum to define ‘economy,’ working towards a shared understanding of our current economy in the context of participants’ lived experiences in NYC neighborhoods. Participants will learn about the role of banks and other financial institutions in perpetuating inequality, and name the values and systems that drive and uphold our current economy. Part 2, A New Economy: What Is Possible? (Aug. 17) – This session builds on Part 1, and focuses on cooperative economics strategies for building a just economy that works for all. We will explore concrete and proven models that community groups can pursue to ensure community-led cooperative workplaces, housing, financial institutions, and land use. Participants will see how the curriculum module will support community-led efforts to create and sustain worker and financial co-ops, community land trusts, and other vehicles that promote cooperation and community control. This workshop will explore ways that community groups can use shareholder action as a powerful tool for social justice organizing. Through shareholder action, grassroots groups have won significant media attention and gained direct access to CEOs and corporate boards. Learn how to plan effective shareholder action tailored to your group’s campaigns. Hear from organizing groups that have confronted the big banks and won meaningful change. The workshop will cover strategies for direct action, both inside and outside of shareholder meetings, as well as the nuts and bolts of filing effective shareholder resolutions to press for change. Through interactive exercises and case examples, participants will explore ways that organizations can engage members in effective research and mapping efforts that support powerful campaigns. 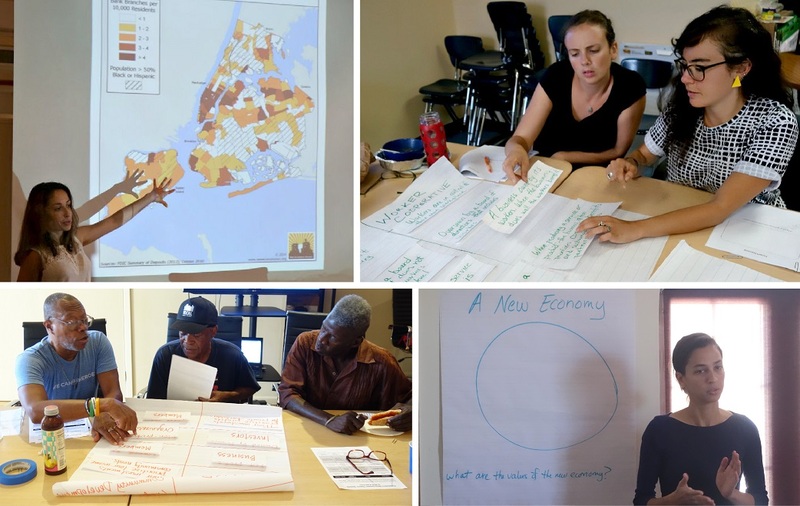 Hear from groups that have applied research strategies to win campaigns and find out about an array of incredible resources available to community groups in NYC. This session will provide an overview of community land trusts (CLTs), as a promising tool for addressing root causes of homelessness and displacement, and for creating truly affordable housing over the long term. Come learn about the structure and history of CLTs, CLT creation and stewardship, and how your group can start a CLT and get involved in the CLT movement in NYC. BONUS: Participants will play Trustville, a new board game that shows players the benefits of CLTs and mutual housing associations (MHAs).